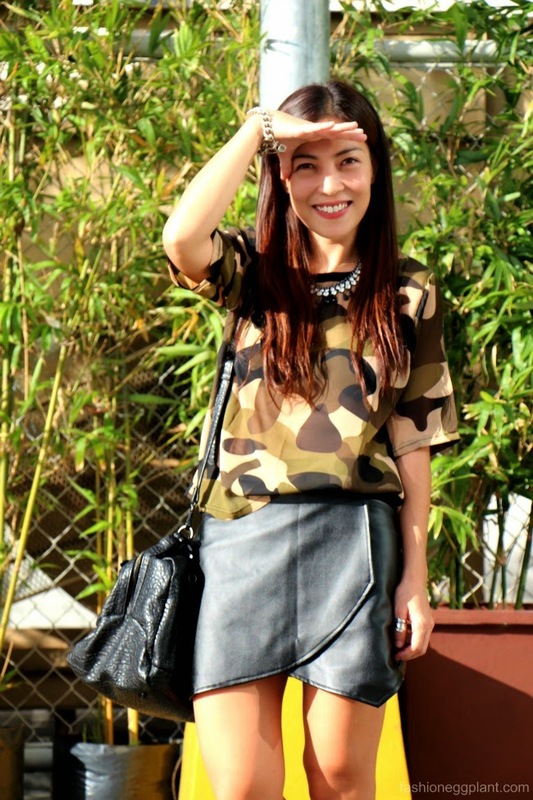 Like stripes, polka dots, and florals, I think camo is slowly turning into one of those timeless prints. I've seen numerous interpretations on the Paris catwalks but my favorite is still the classic military-inspired color combination of browns and greens. For today's #OOTD, I am wearing two pieces in prints and cuts that have long been favorites of mine - camo and the irregular hem origami style skirt which I'm sure you've seen me wearing numerous times in my outfit posts. So many times indeed that the fabric has began to show signs of wear and tear which is precisely why I love this particular one I'm wearing in the photos right now. Unlike my old pair of skorts which was made from a stretchable fabric, this one's done in leather which makes it a lot more sturdy and capable of more abuse than my old one. It's also timely for the cooler weather we're beginning to enjoy. I predict many many future style posts in these. Another cool find is this camo print blouse which was made more interesting by using a delicate fabric like chiffon in a boxy silhouette. The unusual combination makes it more memorable and all the more covetable.